In Marsha Norman's two-hander "'night, Mother" a daughter announces to her mother near the top of the play that she is going to kill herself in a couple hours' time. The remaining 70 minutes of the 80-minute play is taken up with the mother's futile attempts to persuade her daughter not to do it. 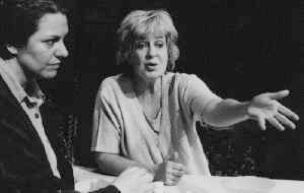 The play won the Pulitzer Prize for Drama in 1983 mostly likely because of its supposed likeness to Greek tragedy, its natural dialogue and its two powerful roles for women. If you can accept the initial premise, the play seems written almost intentionally as a subject for compare-and-contrast essays for first-year English students, which it has indeed become. The Eclectic Theatre production was a hit at the 2001 Toronto Fringe Festival. This fuller production now at Artword has its moments and a great performance by Jayne Eastwood as the mother, but it never convinces us that the initial premise is anything but artificial and manipulative. The premise of the play is that Jessie, the daughter, can announce her plan of suicide and still expect to spend a normal last evening with her mother, Thelma. After the understandable fuss Thelma makes, Jessie exclaims about three-quarters through "I should've just left you a note!" We can only agree--but then there would be no play. Except for the short duration of her failed marriage, Jessie has lived with her tradition-bound mother all her life. Why then is she surprised that Thelma does not take her news well? Norman would like us to believe that Jessie has told Thelma to attempt a last chance at bonding with her. Yet, we hear that she has been planning her suicide for several months. Why then does Jessie decide to cram all this bonding into less than two hours? Why also does she look for her father's pistol less than two hours before she plans to use it? Written as it is in a realist mode, much of the play reads as much like Jessie's justification of suicide as Norman's justification of her premise. The mother's response, for example, to Jessie's exclamation about the note is, "Yes! No. No. I -- might not have thought of all the things you've said". There are a number of aspects of the play that have led to comparisons with Greek tragedy. The play observes the unities of time, place and action. All the events that lead to the fatal conclusion have already taken place. Violence occurs off stage behind a significant door. Jessie could be likened to a protagonist like Antigone or Phaedra who seems to long for death. Thelma could be likened to a combination of the Nurse and the Chorus who understand nothing but the everyday and plead for the continuance of life. The problem with this, as with all bourgeois tragedies, is that Jessie's suicide which she construes to be saying "No" to the world as it is and herself as she is, derives from a purely personal and idiosyncratic point of view and much as Norman would like it to have greater resonance, it is too particular to do so. Jessie's justification of suicide seems to derive entirely from Albert Camus's early existential works, ignoring of his repudiation of suicide in his later writings in favour of living for others. Unlike real tragedy, "'night, Mother" is a downer without being uplifting. To reinforce the unities, designer Sean F. Mulcahy has made the set identical in size with the stage in Artword's main space. He has reproduced in minute detail the everyday clutter of a lived-in home. The downside is that this spacious set does not conjure up the claustrophobia that the play asks for and that would help explain why Jessie seeks to escape. Mulcahy highlights the important door with his lighting, but to make a more accurate reference to classical tragedy the door to Jessie's bedroom should be in the centre of the back wall. Director Jordan Merkur has made the interaction between Jessie and Thelma as naturalistic as possible. The main difficulty is that he makes Jessie's revelation of her intentions seem impromptu rather than planned which compromises the sense of inevitability Norman tries to create. If the play is to be viewed in the light of classical tragedy, we should be certain long before Thelma is that Jessie will not be dissuaded. The one reason to see the play, one that overrides all my negative remarks, is the superb performance of Thelma by Jayne Eastwood. She is utterly convincing as a middle-American woman of middling interests trying to cope as best she can with the total affront to her way of life that Jessie's suicide represents. Eastwood gives us an ordinary woman stretched to the limits of her abilities, using every argument she can muster to prevent disaster. Yet, in the midst of all this, she gives us the sense of Thelma's own narrowness, that she wants things to return to normal as much to prevent any disruption in her own as to save her daughter's life. When the inevitable happens it is heartbreaking and we cringe as if voyeurs of someone's personal grief. As Jessie, Alison Smiley suffers under Merkur's indecision about her character's motivations. We should never think, as we do here, that Jessie might waver in her decision. Smiley herself allows the tension to relax which should be present even when the two are sharing cocoa or putting a slip-cover on the sofa. Smiley so well conveys Jessie's love for her mother, it is difficult to see why death is the only solution to her discontent. But this is one of the problems with the play itself. If you can ignore the central premise, "'night, Mother" can be enjoyed for its realistic depiction of a mother and daughter in crisis. But even if you object to the artifice of the central premise, you will be happy not to have missed one of Jayne Eastwood's rare appearances on stage especially in so powerful a performance. Photo: Alison Smiley and Jayne Eastwood. ©2001 Eclectic Theatre.